There was a time when Google highlighted 10 local listings in that little map that populates at the top of local search results. Over the years, however, that number shrank to a “map pack” of seven, and finally dwindled to displaying just three. These three local listings are referred to as the local “snack pack”. While it may seem difficult to earn one of these coveted spots in Google’s search results, it is doable. Focus on some of the essential steps below to optimize your local search rankings and make your business more likely to appear in Google’s snack pack. When trying to improve your local search rankings, one of the first things you need to do is make sure that you’re sending out the right signals about your business. If your business is listed in online directories such as Yelp, Moz, Yellow Pages, or TripAdvisor, you need to make sure that your business is categorized correctly and consistently across all mediums. Additionally, you might want to check how the current top three spots are classified and go with the classification that most often appears in top results. 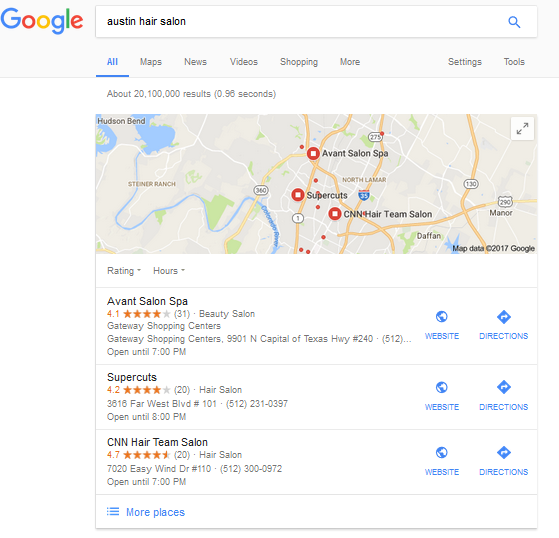 For example, if we Google “Austin hair salon”, two of the top three results are businesses classified as “hair salon”, while a third is classified as “beauty salon”. If you own a place where people come for a hair cut, you probably want to classify it as a “hair salon” for purposes of snack pack rankings. When using social and citation sites such as Facebook, Tumblr, Yelp, and TripAdvisor, it’s also important to make sure your contact info, physical address, email addresses, and all relevant business info are consistent and accurately written. Slight differences such as the word, “Road” being abbreviated as “Rd” in one place, and spelled out on another directory, can make a big difference. Take the time to make sure these seemingly minor details are exactly the same across all channels. If you’re not prioritizing online reviews, it’s time to start. Review sites like Yelp, Angie’s List, and others allow users to leave reviews and give ratings. Social media websites such as Facebook and Google+ also have these rating and review abilities as well. Google’s updated algorithm and potential customers alike place a great deal of trust in online reviews, so be sure to encourage customers and clients to rate your business online if you know that they have had a good experience. This can be done by simply sending a follow-up email with quick links to your review pages or offering customers a discount on future services when they leave a review. It is also important to take care with the design of your website. Make sure that the site is attractive, easy-to-use, and mobile-friendly. Additionally, focus on on-page optimization factors to ensure that your site is properly optimized for relevant keywords that are important to your business. It’s also good practice to make sure there is a contact page that has your address and contact info. Again, make sure that your name, address, and phone number are consistent with the directory sites and social media sites you use. Links across the web can also give Google an idea of what your business is all about. If you have links pointing to your website from poor quality, spammy sites, Google will notice. If there are too many suspect links, Google might even slap your site with a penalty. If possible, find a way to get rid of any spammy links that exist; this might require contacting each webmaster and asking for the link to be removed. Ideally, you want links that are pointing to your site to be of high quality and come from authority websites that are related to your business. While it can be difficult to leave so much of your business’ fate in Google’s hands, getting on the search engine giant’s good side can do wonders for your business. Be sure to utilize some of these methods above and you’ll maximize your chances of helping your business stand out from the pack – the snack pack, that is.